The department de Huancavelica features one de the roughest terrains in the country, formed by valleys, deep gorges, towering mountains, sinuous roads, and mesas. 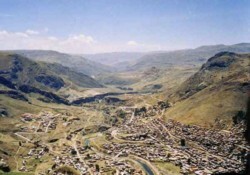 The city de Huancavelica is bordered by fertile fields and green pastures where cattle graze. These highlands were inhabited by the Waris and later by the warring Chancas. The area was finally incorporated into the Inca Empire and became a military center. Following that period, the Spanish discovered silver and mercury mines, a reason for establishing themselves there. Currently, the city preserves its mansions and magnificent Colonial churches. In the surrounding areas, there is the town de Santa Barbara with its old church and mines that have been used since Colonial times. You can also visit Izcuchaca, a center for pottery located seventy-eight kilometers from Huancavelica where there are hot springs and an archeological site.